Overview : Get your ROCK on with this alternative Les Paul Guitar Controller. 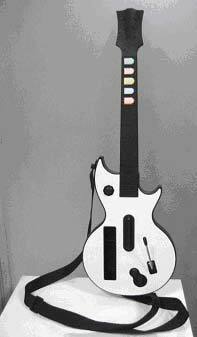 Quality/Usability : When a new Guitar Hero game comes out, it only comes with one guitar. But what if you want your friend to join in on the fun or help you out or even duel it out. You either have to wait for manufacturer to release standalone guitars or buy two sets and sell the extra game. If you're late to jump on the bandwagon, who wants to buy or try and locate previous version of the game? PEGA, Nyko and other 3rd party peripheral manufacturers try to fill that void as well as offer a cheaper alternative but is the price what you pay, what you get? I tend to have friends over and we rock out on Guitar Hero on the Nintendo Wii. We usually have to take turns using the guitar as I only have one. Since it gets a bit repetitive and tiresome of having to pass the guitar around, I thought I'd review the Wii Wireless Crazy Guitar Controller. The Wii Wireless Crazy Guitar Controller looks almost exactly as the Official Les Paul Guitar that comes with Guitar Hero for the Nintendo Wii..front and back. The Crazy Guitar comes in 2 pieces..3 if you include the detachable faceplate. Also included is a shoulder strap. As mentioned above, the Crazy Guitar looks identical to the original Les Paul Guitar but there are some differences. The corner near the joystick on the original Les Paul is rounded. On the Crazy Guitar, its pointed. If you were to swap faceplates with each other, the tabs will fit, however since that one specific corner is rounded or pointed, it wont fit in that section. The back looks the same. There is a locking and unlocking mechanism for the neck of the guitar as well as for the faceplate. I dont know why there is a removable faceplate for the Crazy Guitar if there doesnt seem to be any replacements. You can paint on the faceplate but its already glossy. The compartment to store the Wii remote also has a little compartment to store the wrist band. To connect the neck of the guitar to the guitar itself, simply line up the neck and just push in. It will lock in place. To remove the neck, simply slide and hold the unlock and pull the neck out. When I first opened the box, I noticed something different on the neck. There is grease along the inside. This is suppose to allow the neck to slide in easily. Although it does, it makes a bit of a mess. I had grease along the side of the Guitar as well as the faceplate. The buttons on the Crazy Guitar are color coded but white while the original Les Paul is color coded and black. The buttons are slightly raised higher on the Crazy Guitar. The controls worked great and as they should. The Guitar Hero game registered each button press. However, the strum bar doesnt have that loud clicking noise. Some prefer it to be more quite but at the same time, this also means it did not register my presses which would result in me missing crucial notes and from gaining full Star Power. Conclusion : Overall, the Wii Wireless Crazy Guitar Controller worked great as a spare guitar controller. It feels and fits like the original Les Paul Controller. It would be nice if it was shaped like the Les Paul so that the faceplates were interchangeable but I can see that there would be legal issues with that. If it wasnt for the pointed corner near the joystick and missing Guitar Hero logo on the back, a normal person wouldnt know this was made by a 3rd party manufacturer. Thats how close it looks to the original guitar. Images via comments. Additional images from DealExtreme.